Diving into the ocean off the coast of California might look something like this... on a day with good visibility... if you're really lucky. But, in case you didn't get to see all of these critters, or if you want to see them all without having to get wet, here they are in all their bright beautiful glory. Keeping the bright orange Garibaldi fish company are two moray eels, an octopus, and an assortment of starfish, nudibranchs, sea anemones, gorgonian fans, zooanthids, sea urchins, and other sea creatures. This wall hung sculpture measures 2' wide by 4' high. 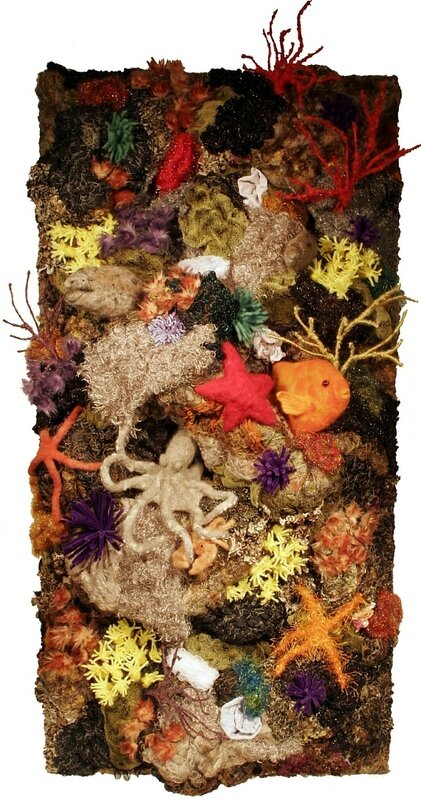 The octopus, eels, fish, starfish, and anemones are all sculpted from wool fibers using a time consuming needle felting process. (The octopus alone took over 100 hours to create.) The gorgonian fans are made from wire painstakingly wrapped with yarns. 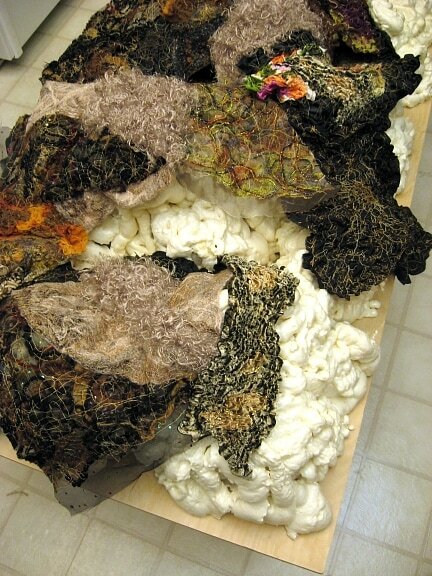 The rocky base is covered in an assortment of fabrics including hand created fabrics. Here's what is underneath it all. 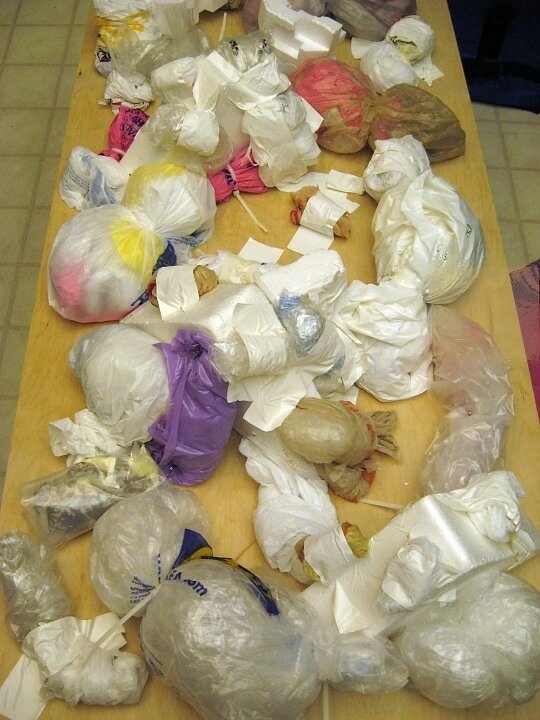 I used up a bunch of plastic bags and Styrofoam pieces. (Better than putting them in the trash, right?) These were taped, stapled, or glued to the 2'x4' piece of plywood. This stuff forms the general shape of all the cracks and crevices that the critters will live in. The next step is to spray on foam in a can used to insulate your house. I think I used four cans of the super expanding version of this foam. I added one can at a time with at least 24 hours in between to give it enough time to expand. I didn't want to close up any of the crevices that I am trying so hard to create. Here I am spraying the foam. The piece is almost to the point that is is covered with enough foam. I don't want to over foam it as I will still be adding the thickness of fabric over the entire piece. Also, I don't want to make the crevices too tight for the critters to fit into. Once the foam has had time to expand and cure, the next part of the process is to cover the entire piece with the rocky looking fabric. Some of the fabrics I use just as they came from the fabric store. Others I add texture to by a sort of free-form smocking technique. The most time consuming are the fabrics that I have to create myself. The fabrics get hot glued directly to the foam. I used over 4 dozen hot glue sticks just to glue the fabric down. (And yes, I burned myself many times. )Here you can still see some of the foam that hasn't yet been covered by the fabric. I had to use my kitchen floor for this as it was the only non-carpeted room in my house with enough space to work and to be able to walk around the entire piece. For five weeks, I had to maneuver around this piece if I wanted to actually eat. Once the background is completely covered, all the critters are glued down. (Sorry, no photos of critters being created. I can't give away all my secrets, now can I? 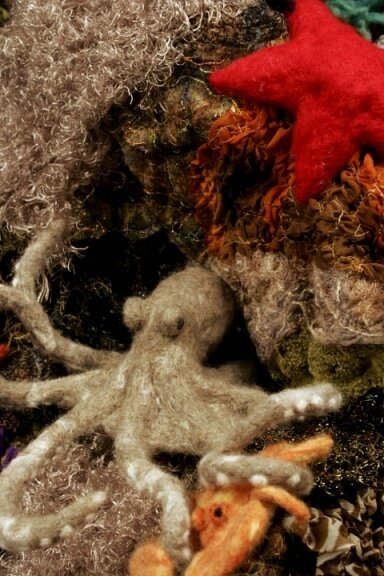 Although, I have now created a tutorial on how to make a needle felted starfish.) Now, understand that I just compressed several months worth of work into a few short paragraphs. Here's a nice closeup of the octopus with the crab he is about to have for lunch.